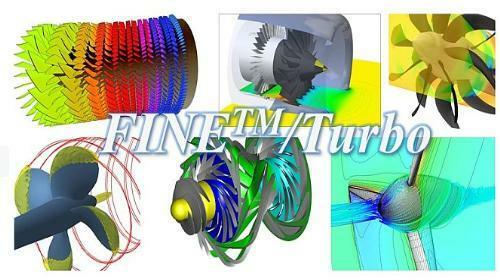 The FINE / Turbo program is the world's first CAE software complex (PC) of high level, focused on solving specialized CFD tasks of turbomachinery and bladed machines. AutoBlade is a parametric oscillator of the blade rims, it allows the engineer to quickly create and instantaneously upgrade the flowing part of the turbomachine while working in terms of turbomachinery (chord, entrance, exit, throat angles, etc.). AutoGrid - automatic block-structured grid generator, inextricably linked with AutoBlade. This connection allows you to parameterize not only the geometric but also the grid model, which in turn makes it possible to integrate the NUMECA PC into the overall design system of the entire enterprise. AutoGrid can create parametric grid models of blades taking into account all the features - blowing of cooling air, bandage, gaps, etc. Euranus - the calculation module (solver). Due to the structured approach and the multigrid option (nested meshes), the solution is 3-5 times faster than any other universal CFD package. This requires 2-3 times less RAM. Unique solutions NUMECA for the joint calculation of mobile and fixed calculation areas is aimed at obtaining a fast non-stationary solution for multistage machines with different periodic boundaries. Including the opportunity to explore Clocking Effect. This approach is used to quickly obtain an exact non-stationary solution for multi-stage turbomachines. Simplified methods of flow analysis in the flow section of the "Throughflow Model" and "Blade to Blade Module" serve to quickly assess the quality of flow in the blades and the distribution of flow parameters over the blade height. IGG is a block-structured grid generator for arbitrary geometry. A powerful and convenient environment for building high-quality discrete models. Highly effective algorithms for smoothing multiblock meshes are implemented. The custom scripting system greatly simplifies and automates the generation of grids for typical elements. CFView - a powerful visualization solution platform, provides a full set of capabilities to display the qualitative and quantitative characteristics of 2D / 3D calculations. PC FINE / TurboTM - is used to solve practical problems of hydro and gas dynamics in the design and optimization of all types of blade machines (turbomachines): multistage axial, radial and mixed compressors, turbines, pumps, fans and propellers, as well as snails, diffusers, heat exchangers and exhaust systems.